Ice cream is a popular dessert option in our house, and probably anyone’s house, but our two youngest brothers don’t always eat the more “adventurous” flavors we try (such as pistachio, even though it’s technically a classic flavor!). They were, however, thrilled when we decided to make cookies and cream ice cream, and Henry even helped cut up the Oreos! 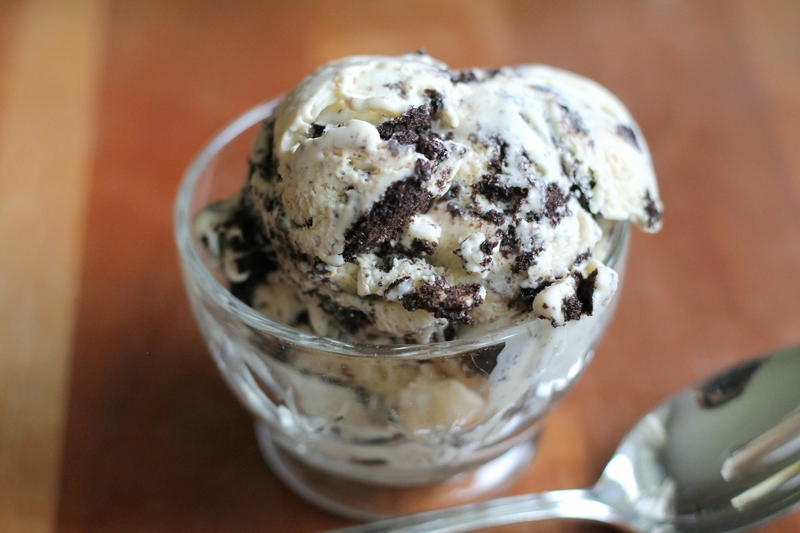 Our main complaint with cookies and cream ice cream is that there are rarely enough Oreos, but that isn’t a problem in this particular recipe. The ice cream base itself is rich and smooth, pairing perfectly with the crunchy cookies. You can’t get much better ice cream than this. Yum! In a medium saucepan, combine the milk and cream. Warm over medium heat until bubbles form around the edges. In a medium bowl, place egg yolks and sugar and whisk together until smooth. Slowly pour the warmed milk mixture into the egg yolk mixture and whisk constantly. Pour the mixture back into the saucepan and continue to cook over medium heat, stirring constantly for 5 to 8 minutes, or until the mixture has thickened enough to coat the back of a spoon (mixture should be about 175 degrees). Pour the custard through a fine-mesh strainer into a bowl and whisk in the vanilla extract. Cover with plastic wrap and chill in the refrigerator for at least several hours (we like to make ice cream bases in the evening and let them chill overnight. Then we’ll churn them the next morning and let the finished ice cream firm up until lunch/dinner). Pour custard into an ice cream maker and churn according to the manufacturer’s instructions. Once the mixture has the texture of soft serve, remove half of it from the ice cream maker and scoop it into a container. Add half the chopped Oreo pieces and fold in with a rubber spatula. Add the remaining ice cream and Oreos and repeat. Freeze until fully hardened enough to scoop nicely. Serve. Enjoy!